Lucy Knisley grew up in the kitchen. As the daughter of a chef and a gourmand, she knew from a young age that good food is a celebration in and of itself. Whether she was a pre-teen running unsupervised through the streets of San Miguel, sitting on dusty curbs eating Mexican street food with her friend Drew, or a twenty-something backpacker, obsessively pursuing a way to replicate the magical apricot croissants she ate while sitting on the steps of her hostel in Venice watching gondolas bob in the canal, Knisley navigates her way through life "doing those things with excitement, curiosity, and relish." When a book revolves around food and travel, I'm already sold. I don't need to know the specifics. Just send me a copy; I'll read it. But when a graphic memoir revolves around food and travel? Well, I think the only next best thing would be to go to those places and eat the food yourself. And when a sequential art book begins with a recipe for chai tea, well, you had me at the chai (which I am currently sipping on as I write this review). Other illustrated recipes in this book include: marinated lamb, pesto, chocolate chip cookies, spaghetti carbonara, huevos rancheros, sushi rolls, and more! And while I certainly wouldn't classify this as a cookbook, the recipes included in this lovely little volume are worth a try. 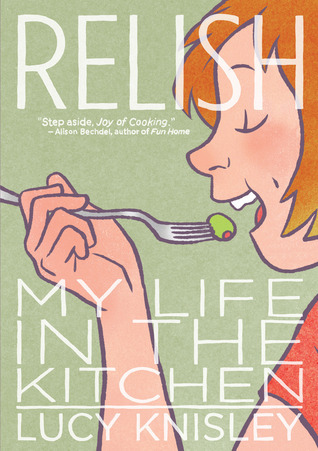 Speaking of classifying books, one might automatically assume that a graphic memoir with the subtitle "My Life in the Kitchen" would be categorized as adult nonfiction, but Macmillan published Relish under their children's division, so this book is really unique in that it can fit in almost any age section in a bookstore because it has something for everyone. However, it should be noted that there is a scene in the book where Knisley's friend Drew buys some racy magazines in Mexico, so for that reason I would recommend Relish for seventh grade and up. For kids who enjoyed Sara Varon's adorable graphic novel Bake Sale, I'd say that Relish is the next rung up their reading ladder. In addition, Knisley's lively, youthful art immediately put me in mind of Raina Telgemeier's Smile and Drama as I was reading it, so that suggestion alone is enough to convince kids it's worth a read. And as an added bonus, reading Relish might even get them to start making pesto, spaghetti carbonara, and heck, maybe even sushi rolls. If this book doesn't bring out the inner foodie in you, then I don't know what will. My 6 year old has just started being interested in really cooking things (other than licking beaters). This book sounds like the perfect start. Thanks for posting! This is a must read for me! I loved her previous book, French Milk. I brought this home from the library recently. And now you've helped me pick my reading material for a delicious Sunday! Here's my Weekend Cooking post. I adored this book! And posted about it this weekend, too. *grin* The chai was actually the one recipe that I wanted to try immediately, but I haven't gotten around to it yet. I covet your mug! I'll be checking out whatever Knisley does next - I think she's utterly charming. Thanks for sharing your review! I loved this book! I've become a Knisley fan.